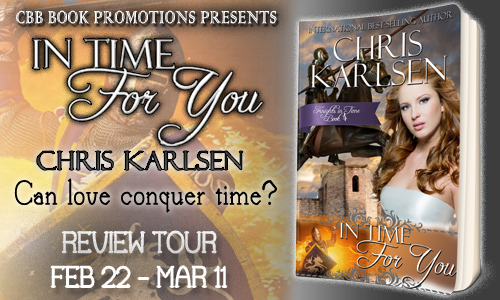 Welcome to my tour stop for In Time for You by Chris Karlsen. This is a historical romance with time travel and is out now. Check out the tour page for the full schedule. I’ve always enjoyed a tale of time travel. I’m not sure what it is about the idea that fascinates me so much, but I’m captivated just imagining being in the here and now one moment and the next, being thrust unceremoniously forwards or backwards along time. Would I be able to survive? Would I know enough about the history of the place (if, indeed, I were sent back in time and not forwards) to make a go of it? Or would I just sit down and cry? Author Chris Karlsen tackles many of these same questions in In Time for You. Sisters Electra and Emily are out for a picnic with Electra’s boyfriend, Roger, when the two women are suddenly pulled from 2015 to the mid-1300’s. At first, they don’t understand; their minds spin tales of an elaborate movie set or reality television program. But, soon enough, Electra and Emily are forced to accept what a part of them have known since the beginning: they have traveled through time. They aren’t the first in their family and circle of friends to have such an experience; but what Electra doesn’t know is that the man she is in love with has also traveled through time. In his case, Roger came forward and now he’ll find a way to return to the time he first came from in order to get Electra back. For fans of historical fiction, In Time for You is a goldmine. There are tons of period descriptions and details to delight and fascinate. The story has plenty of plot points for all readers – action, history, adventure, romance, and more. I felt at something of a disadvantage because In Time for You is actually the fourth book in a series, “Knights in Time.” Many references are made to past experiences and characters that, I assume, are introduced in previous stories. It was a little difficult to follow and understand, so I would recommend that readers interested in this book go back and start the series from the beginning – I’m certain doing so will only enhance the experience. I want to thank The Girl With Book for taking the time to read and review In Time For You and for such a lovely review. It is much appreciated. Thank you so much for hosting a tour stop and sharing your thoughts! I’m so glad you enjoyed!